The Martin Yale CR828 Electric Smart Crease Paper Creaser saves time and money. The Martin Yale CR828 Semi Automatic Paper Creaser offers industrial-strength quality creasing at your fingertips in a small, sleek, tabletop design. 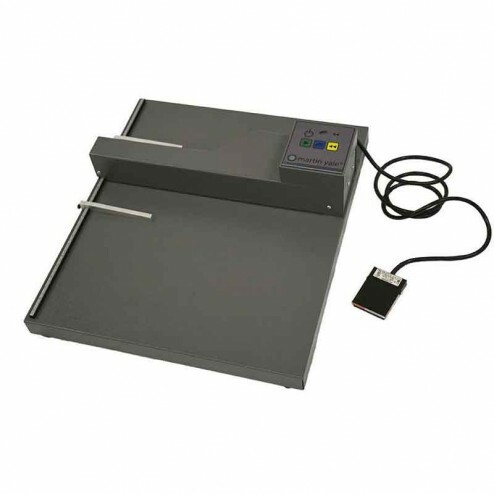 This creaser offers setup with a hands-free foot pedal or push button operation. It prevents cracking in toner-based digital printouts while providing clean, professional quality, creased literature. he Martin Yale CR828 is designed to provide performance, efficiency and a consistent quality of product outcome with each use making it essential to any business that prides itself to professional quality literature production. Quick and easy set-up, simply remove from the packaging, install the paper stops, plug in and done!